They say this cheddar gets better with age. I don't know about that because we ate it fresh. 😉 For those of you without a cheese press, you can eat the curds fresh and un-pressed! This raw cheddar cheese is delicious! And if you don't have a cheese press, feel free to eat the curds fresh and un-pressed! Adapted from The Cheesemaker’s Manual. 1 gallon of milk makes approximately 1 pound of cheese. Put the milk in the pot and slowly over a couple hours warm it to 86 degrees Fahrenheit, stirring occasionally. Keep it covered to preserve heat. Sprinkle the mesophilic culture on top of the milk. Cover and allow to culture or "ripen" for 45 minutes to 1 hour, keeping the temperature at 86 degrees Fahrenheit. During the summer, turn burner off and cover pot with a bath towel to keep at temperature. Meanwhile, dissolve rennet in about 1/4 cup of water. Set aside. After the ripening time, pour the water-rennet mix into the milk, and stir well. 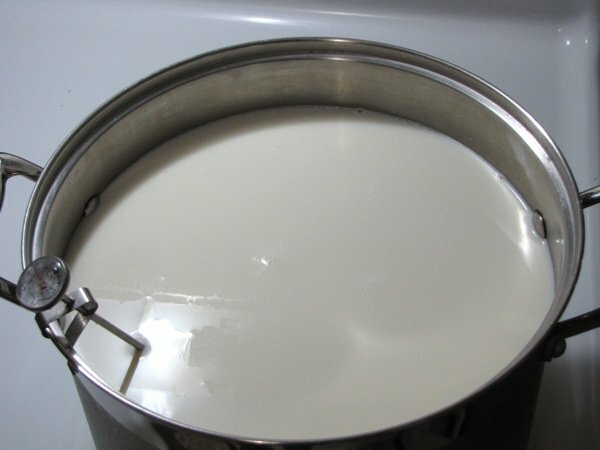 Cover the pot again and allow the milk to set for 30 to 45 minutes, until a firm curd forms. Once curd forms, if cut into with a knife, it should make a "clean break" -- where the curd splits and whey pours into the crack. See picture here. Then cut the curd into 1/2 inch cubes. Click here to read some good basic directions for making those cuts. Be very gentle with the curds at this point. In fact, after cutting them, just let them sit for 5 minutes, undisturbed. Keep the cover on to keep them warm. Then turn on the burner (if it isn’t on already) and heat the curds to 102 degrees Fahrenheit over the course of 40 minutes or so. During this time, stir gently every 5 or 10 minutes to keep the curds from sticking and make them smaller. Keep the curds at 102 degrees Fahrenheit for an additional 30 minutes. Stir occasionally. Curds should be firm and a bit stretchy, surrounded with lots of whey. They should hold together if pressed. For more info on a texture test, check out The Cheesemaker’s Manual. Let the curds settle at the bottom of the pot. Pour off about 2/3 of the whey into another pot or container. You can keep this raw, cultured whey for lacto-ferments or soaking where a stronger flavor works well (such as veggie ferments). Then transfer the curds to a colander, leaving the remaining whey in the pot. Put the colander to nest inside the pot, so the curds are suspended over the warm whey. This begins the “cheddaring process” which gives the cheese its squeaky texture. Let the curds drain for about 1 hour. Cover the colander with a piece of cheesecloth and the pot lid. Keep the burner on low if necessary to keep the whey warm. 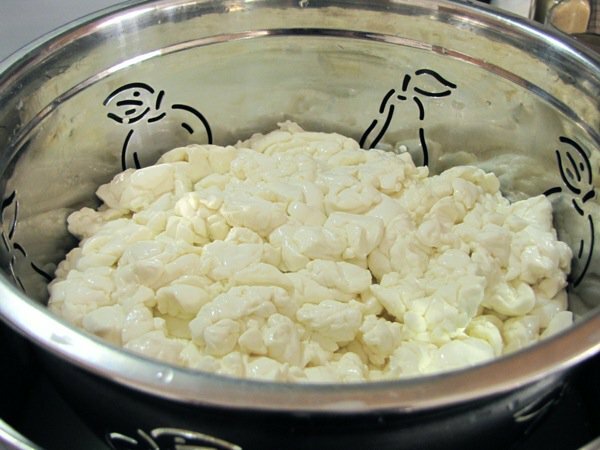 During this hour, turn the slab of curds over a few times to make sure they’re draining well. Take the slab of curds out of the colander, put it on a cutting surface, and then cut it into chunks. Then cut the chunks into slices. Put them in a bowl and toss with fine sea salt until just slightly oversalted. Remember that some of the salt will leave with the whey that gets pressed out. If you don't have a cheese press, these curds are fresh and ready to be eaten! Delicious! If you do have a cheese press, line mold with cheesecloth — could be the same piece that covered the curds during the cheddaring process. Fill the mold with the slices of curd. Using your press’s setup (follower, etc. ), press the cheese at 10 to 15 pounds for about half an hour. If the pressure loosens during this time, tighten it up again. Take the cheese out of the mold, turn it over, and put it back in the mold (cheesecloth and all). This makes it pretty on top and bottom. You’ll need a tray to catch the whey that drains during the pressing. Continue pressing overnight (or 12 to 15 hours) with continual pressure, working it up to 35 to 45 pounds for the duration. Once again, check frequently if the pressure loosens and adjust the press as necessary. What happens is the cheese gets smaller and shorter, but the press stays in the same position — thus the pressure on the cheese gets relieved, and we need to come in and tighten it up again. Not all presses work like this, but mine does. Take the cheese out of the mold. Air dry it at room temperature for a few hours or overnight. Eat fresh, or age for 1 to 2 weeks in the refrigerator. Wax it for longer aging. Mild cheddar develops in about 4 weeks, medium in about 2 to 3 months, and sharp in 6 months or more. Allow longer aging times for cheeses made from pasteurized milk (another reason raw is better!). Enjoy! 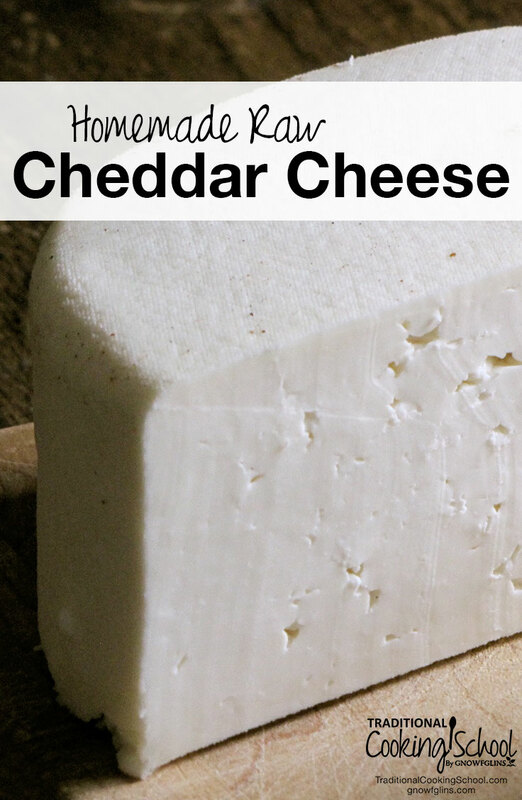 We make this cheese and other cultured dairy foods in the Cultured Dairy & Basic Cheese eCourse. You get video demonstrations and print tutorials to guide your mastery of yogurt, sour cream, buttermilk, and some great basic cheeses. Oh Wardee, your cheese looks beautiful! We made a stirred curd cheddar a month ago and we opened it up to see how it was. It tasted delicious! We re-waxed it and are waiting patiently to open it again on Thanksgiving. My husband is going to be taking a traditional cheddar class over in Yamhill, Oregon in November. We’re really looking forward to learn more about making traditional cheddar cheese! 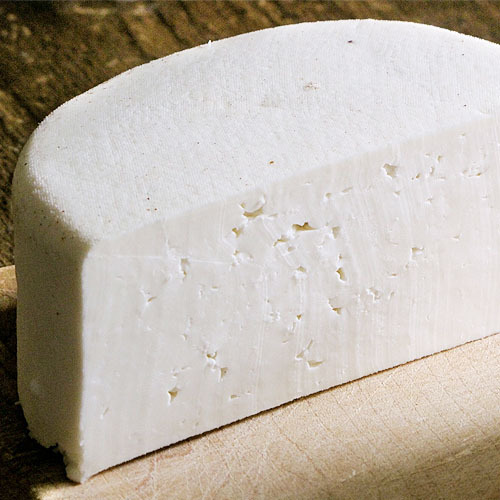 Tasty looking, I would love to make some goat milk cheese, but I just don’t think I have the patience. I’ve got to really admire someone that does! Wow, it never dawned on me to EVER make this, and the cheese looks yummy!!! Oooh! I’m so glad you posted such detailed instructions! I was looking at your Twister post earlier and was wishing for more info on your cheese making. Thanks a bunch! Thank you for this post!!! I’m very much looking forward to trying this recipe out; especially when we have our own dairy animals next year. That looks easy enough. Cant find cheddar cheese here in Italy…this could be a good alternative. Thanks for sharing! 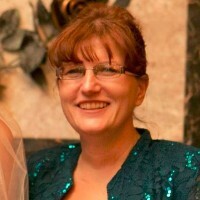 Tina — Click the cheesepress link above. That’s the one I use. It can do 2 to 4 pounds of cheese. This works well with my recipes as my pot can hold about 3 gallons of milk, which makes 3 pounds of cheese. This is the neatest thing ever. I so want to do this. I can’t afford a cheese press right now, but maybe for Christmas. 🙂 My kids LOVE cheese, and we eat a lot of cheddar, but they cannot handle pasteurized dairy. We can (and do) buy raw cheese, but it would be great to make our own and know that it’s completely safe. Ah! I can’t wait. I love how easy this looks! Once I get a few more things under my belt, cheese-making is on my list. I LOVE sharp cheddar too. That is what I need to learn how to make. HOLY cow, you made cheddar cheese! Is there any alternative to the cheesepress? It is a fair bit of money…. There are lots of ideas and instructions on how to make your own press online. A simple google search shows lots! You might have some of the supplies laying around at home. Would be lots cheaper than buying one. Would this work with a lactose free milk? I have been lactose intolerant and have not been able to enjoy cheese for years. I’d love to be able to use it in cooking. I’m trying to build up the courage to try this. Dh is making a press for me. 🙂 I like your colander! Very pretty. I did it! With my book and the help of your post. I kinda messed up a step but it should still be cheese. lol It’s still in the press so time will tell. Good job, Marg! 🙂 Even when cheese isn’t perfect, I find it is usually delicious! Thanks! I look forward to trying it! My cheese making supplies arrived today and I am sooo excited to get started! Like Rebecca (just above my comment, I think), I’m unsure how much milk to use when following the measurements listed above for the mesophilic culture, vegetable rennet, and sea salt. Are those measurements specific to 2 gallons of milk, 3 gallons, or 4 gallons? Thanks so much, I can’t wait to get this going! Zane — You can use the specified amounts of rennet and culture for anywhere from 2 to 4 gallons of milk. It is flexible. Have fun! Curious: The book you got this recipe from… does it call for raw milk? If so, do a lot of the recipe use raw milk to start? I am wanting to get into cheese making this next year but the books I have found all use pasteurized milk. I have noticed a lot of people asking about a cheese press and being very concerned about the cost involved. I made my own cheese press for about $15 in less than an hour, and that is a hour for someone without true skills! Here is the link to the youtube video where the guy shows you how to make the press. Very easy and it works great! Good luck! http://youtu.be/qdj2MQVuMhs if the link doesn’t work go to youtube and type in Homemade 10 Dollar Cheese Press. The cheese press video on utube is fantastic! Especially when it’s your first time making cheese!???? love it!!! I made this using the above recipe. We also ate them as fresh curds and they are wonderful! Yay Laurie and yay Galen-Deb! I made this cheese and wondered how to best age. I put the wheel in the fridge and it began to crack. It’s not quite dry enough to wax…How did you age yours? I’m just getting started in learning to make my own raw cheese. I would like to make a mother culture because it is more sustainable but the instructions say to boil the skim milk before making the culture, which then would cause the culture to not be raw. My problem is that once it gets past 118* the enzymes break down and my son is allergic to it once that happens. His allergy to pasteurized milk is the main reason I am trying to learn to make truly raw cheese. I am a little confused…every thing I have read in books and online states that if you use raw milk you should be sure NOT to eat it before the 3 month aging period due to bacteria. That if you want to eat it prior to the 3 months aging…to use pasteurized milk. I could see it may be okay to eat it immediately…but after a few days I would think it would be best to wait the full three months. I only use raw milk here for our consumption and will be using raw milk for our cheese, but I do want to make sure that what I give my family is safe. I am wondering the same thing, does anyone know? I am going to have to try thus recipe and see if I can stop at the squeaky stage because growing up in Wisconsin we would get the cheese curds and I loved eating my “squeaky cheese”! Does calf rennet work and use the same as the vegetable? raw means ZERO heat…. this is not raw. present in fresh, raw milk. The low heat is necessary for the mesophilic cultures (which are defined as thriving in moderate temperatures) to grow. You mention waxing the cheese, do you have a “How to” for waxing cheese? I just made this cheese – I am so proud of myself! I followed the directions and it turned out great! This is my first time using my ultimate cheese press from homestead suppliers. How do I press the cheese over night if I have to continuosly tighten it? What does your time line usually look like? I made this cheese with my new Ultimate Cheese Press, it worked great! Can you please tell me what to put it into during refrigeration ? I have it in a ziplock bag, and I noticed there is condensation on the bag, please advise, as I don’t know if this is normal, or if it will hurt the cheese. Is there a better way to store it? Thank you! If condensation builds up, you’ll to pull out and dry and put in a clean (or cleaned and dried) bag. Best to keep it dry – but it’s normal for it to have some because cheese is moist. Hi Millie, thank you for the response 🙂 one more thing, if you don’t consume the cheese right away, is it safe? I have read that raw cheese should be aged 60 days. I made a batch Jan.7th and we want to keep eating on it, but not sure if we can? Any advice will be appreciated thanks! Will it ruin my cheese if it gets to hot while suspended over whey for the hour? It doesn’t get ruined but it doesn’t get a perfect stretchiness. If it gets too hot, it also won’t be raw any more. I was in the caves at Cheddar Gorge yesterday and saw cheddar cheese being aged. The real deal! This recipe looks good fun to try. Do you know how much liquid rennet is equivalent to the 3/4 of a vegetable rennet tablet? Thank you!! I look forward to trying it. Will the curds (if left unpressed) melt like pressed cheese if used in a casserole? Will there be too much whey in them? Can you add salt earlier if you want to only make fresh curds? What point would you add? You could add salt after draining the curds if you’re not planning to suspend the curds over the heated whey (the cheddaring process). I love that this is a raw cheese. I have made it a few times but have noticed on some batches that the cheese is spongier. now I am only making curds but what might be causing the curd to have a sponge like texture? Do you have other ferments nearby? It gets a sponge like texture if it’s too near other ferments, especially sourdough yeasts.